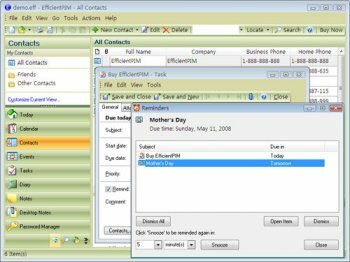 EfficientPIM is a full-featured personal information manager that can help you organize and plan your business and private life. With EfficientPIM you can keep track of contacts, appointments, tasks, to-do lists, birthdays, and much more. The software also gives you space for keeping notes, diaries, and even passwords. In order to be successful you need to be organized and efficient. 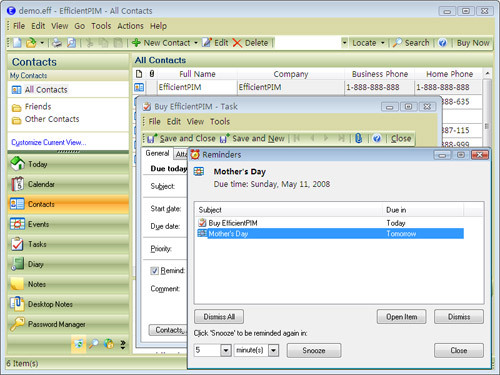 With EfficientPIM all of the things you need to manage are located in one, easy-to-use interface. LOL, call this professional??? Just looks like another PIM to me. No that guy before me says.. You're right It does look fermilure. Go essentialpim people. Same program for free.